EN: I know that everybody is dying to see more Chanel jacket progress, but during the working week my progress is very limited: I really don’t like sewing under artificial light (even more with black fabric!) and from the time I get home to the time my son is in bed, the natural light is gone. So today I want to show you guys a few goodies that made their way into my stash (hopefully not staying in the stash for too long) and also discuss online fabric sources within Europe. Oh and I happened to find another set of buttons which are strong candidates to the jacket instead of the passamanerie ones! PT: Sei que devem estar todos em pulgas para ver progressos na jaqueta, mas infelizmente durante a semana a minha disponibilidade para a costura é muito reduzida. Prefiro coser com luz natural (principalmente tratando-se de tecidos escuros) e desde que chego a casa até deitar o meu filho, a luz natural vai-se. Então hoje queria mostrar-vos os últimos tecidos que adquiri (esperemos que em breve sejam transformados em algo para vestir) e também falar um pouco sobre lojas de tecidos online na Europa. Ah, não esquecendo também que no outro dia encontrei uns botões que são candidatos fortes à jaqueta, em vez dos de passamanaria que tinha considerado inicialmente! EN: A couple of weeks ago I was contacted by a representative of www.fabfab.net (a online fabric and haberdashery shop with web shops in Germany, Great Britain, France, Sweden, Finland, Denmark, the Netherlands, Italy, Spain, Portugal, Poland and the Czech Republic) who wanted to know if I was willing to try their services. They offered to send me materials of my own choice (up to a certain value), free of charge, asking only for a sewn project using their materials disclosing the source of those materials. 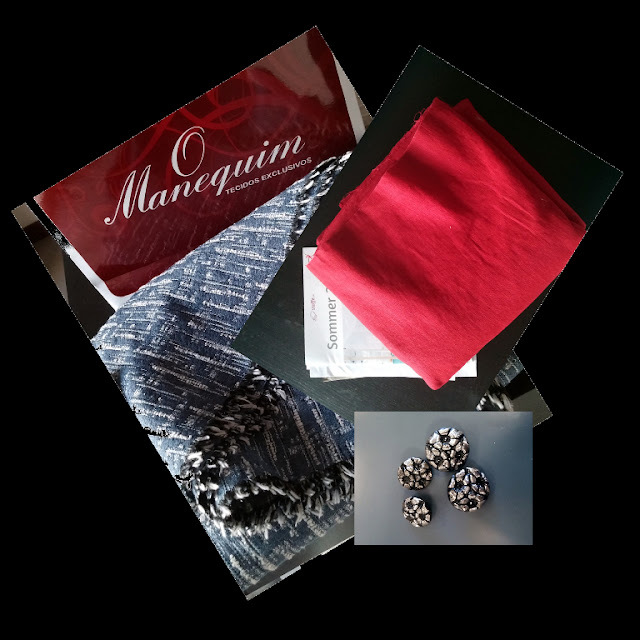 After browsing their fabric offer online on the Portuguese web, I found that they have indeed a wide offer of general purpose fabrics for apparel, along with home decoration and craft fabrics. I also found their prices to be very fair. 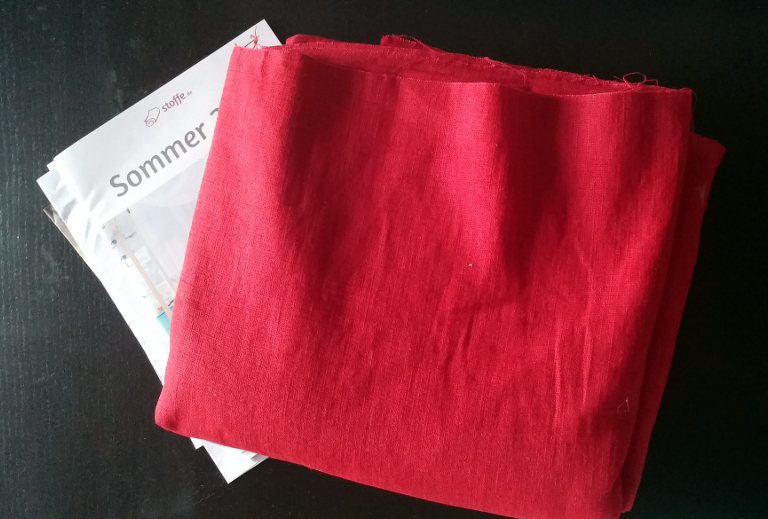 I selected a medium weight linen in red (100% linen) and it took about five working days for it to arrive from Germany. The fabric came well packed, its quality didn’t disappoint and the service and client communication was excellent during this process. I plan on making a jacket or a long vest with this fabric as soon as I finish my Chanel inspired jacket and I think www.tecidos.com.pt got themselves a new client! 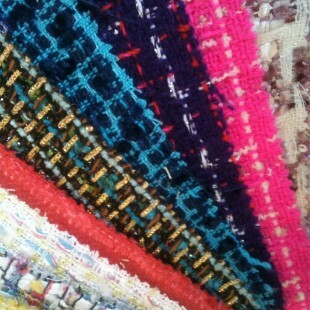 By the way, they send samples of their fabrics and just for subscribing their newsletter you’ll receive a 5 euro coupon. Do any of my readers know this online supplier? Have you ever ordered from their websites? PT: Há duas semanas mais ou menos fui contatada por uma representante da www.fabfab.net (uma cadeia de venda de tecidos e materiais de retrosaria online com representação – websites - em vários países Europeus: Alemanha, Reino Unido, França, Suécia, Finlândia, Dinamarca, Holanda, Itália, Espanha, Portugal, Polónia e Republica Checa). Gentilmente foi-me oferecida a possibilidade de receber sem qualquer custo associado um tecido e/ou outros materiais à escolha com a única condição que fizesse um projeto de costura com esses materiais revelando a sua fonte. Depois de ver a oferta de tecidos disponível no website Português (www.tecidos.com.pt), concluí que de facto têm uma vasta oferta de tecidos de uso genérico para confeção, decoração do lar e lavores e apercebi-me também que os preços são bastante em conta. Resolvi aceitar e escolhi um tecido de linho (100%) de peso médio, em vermelho. Devo dizer que o serviço e a comunicação com o cliente foram excelentes e em cerca de 5 dias úteis recebi o tecido, bem embalado e acondicionado. A qualidade do tecido não desapontou. Planeio fazer uma jaqueta ou um colete comprido depois de terminar a jaqueta inspirada em Chanel e acho que ganharam aqui uma nova cliente! Já agora, podem encomendar amostras dos tecidos e se subscreverem a newsletter da loja terão direito a um vale desconto de 5 euros. EN: I purchased this fabric at a local fabric store here in Aveiro (I’ve just found out they have horsehair tailoring canvas and silk organza available, yay! ), taking advantage of the summer sales which allowed me to acquire approximately two yards of this novelty 100% cotton denim-like fabric for half its tag price. I went to the store trying to find Chanel tweeds/boucles in tones of ivory and came out with this fabric instead. I plan on continuing pursuing the ghost of Coco Chanel but perhaps try a different fabric like this one for a modern approach (like seen in some Chanel by Karl Lagerfeld collections). I've been intrigued by the Marfy 1756 jacket pattern (one of Marfy’s free downloadable patterns! You need to subscribe to their website to be able to download them), but if I end up using it I will certainly morph it with Susan’s three piece sleeve instead. Exciting, no? 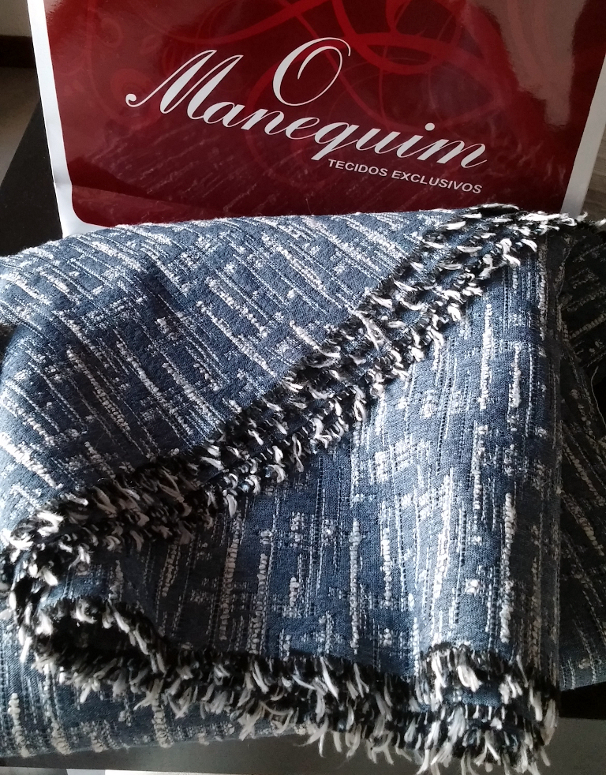 :D. Also on the matter of Chanel style fabric sources, Laura Popa tipped me off about this website specialized in tweeds and boucles (and yarns!! ): LintonTweeds. OMG! I went ahead and ordered their sample pack like immediately! PT: Comprei este tecido na Manequim, a loja com os tecidos de mais alta qualidade aqui em Aveiro, aproveitando a época de saldos que me permitiu comprar 1,7m deste tecido 100% algodão tipo ganga fina a metade do preço original (atenção: descobri que na loja agora vendem entretela de alfaiate, ou seja, de crina e também organza de seda natural!). 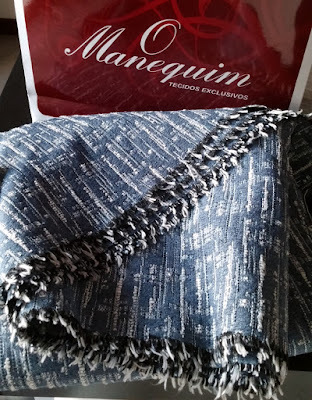 Fui à Manequim à procura de tecido boucle Chanel em pérola (pois!) e saí de lá com este tecido. Continuo obcecada com o fantasma da Coco Chanel, mas quando vi este tecido lembrei-me de algumas versões modernas de jaquetas Chanel, já pela mão do Karl Lagerfeld. Pensei logo no molde jaqueta Marfy 1756 (clicar aqui) que está disponível no website da Marfy como download pdf gratuito (é preciso registarem-se no site para o poderem descarregar)… Se de facto optar por este molde, vou adaptar as mangas da Susan Khalje, que são de três peças em vez de uma só. Já estão tão entusiasmados quanto eu? Para finalizar, recebi uma dica da Laura Popa acerca de um fornecedor de tweeds e boucles de alta qualidade (além de lãs para tricô! ), com loja online: LintonTweeds. Bem, encomendei NA HORA o pack de amostras deles! EN: As a final note, after completing the jacket’s muslin, I checked and found out that I was short on trim (the horror!). Last Monday I ran to the notions store and they had some left, so I’m good again :D. But I also saw these glass/crystal with embedded metal buttons and they had two sizes, and there was enough buttons for the front closure (five) plus the pockets and sleeve cuff (four + four) so I went ahead and bought them. Now I must decide which buttons fit the jacket best,… Ohhh decisions, decisions! PT: Por último, depois de completar o modelo de prova da jaqueta, verifiquei que não tinha galão suficiente (o horror!). Obviamente na segunda-feira a primeira coisa que fiz foi correr até à retrosaria e, sorte das sortes, ainda havia deste galão (pouco mas suficiente!). O problema é que os meus olhos pousaram nestes botões, feitos em cristal com metal embutido,… E tinham dois tamanhos, os menorzinhos ideais para os punhos e, havia também suficientes para os bolsos (os que tinha comprado antes eram todos do mesmo tamanho (os pequenos estavam esgotados) e só tinham 9, ou seja não dava para por botões nos bolsos se usasse abotoadura na frente… Ok, agora tenho que decidir quais usar! I really had to stop myself from buying the blue fabric - it was on the counter crying out buy me buy me! Tany, I haven't forgotten your buttons. But lost the bit of paper with your mailing address. Could you send it by email please. Hugs. Hi Gail, I've already replied to your email! Hugs!